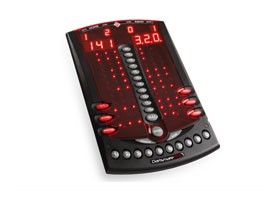 Introducing the Dartsmate Elite™ and Dartsmate Pro™ Electronic Scorekeeping Systems! Dimensions (H/W/D): 190mm. / 265mm. / 25mm. Display sizes: 20.8 mm. / 14mm. Power Supply: 5V 200mA dc Regulated. Play all games: Cricket, 101, 301, 501 - even 1001! 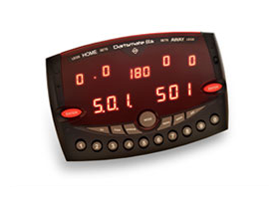 Displays for Score, Total, Legs and Sets! Recall up to 40 scores stored in memory! Delete the last incorrect score entered! Records the overall per dart and per throw averages! Records the number of darts thrown in the last leg! Add scores dart by dart feature, with display! Practice checkouts! Solo play mode! Random number selector. Select numbers between 1 - 999! Selectable start and finish numbers! Memory stores 40 selected numbers! Recall selected numbers! Play Against Computer - 8 different skill levels! Play the computer! 8 skill levels from Beginner to Pro! Energy saving auto power down! Power supply included! Can also be battery operated (using 4xAAA batteries)! Dimensions (H/W/D): 370mm. / 235mm. / 25mm. Power Supply: 9V 550mA dc Regulated. Darts Mode - Play all games from 101 to 1001! Tactics Mode; Play any game, 10-20 plus Bull! Handicap feature in both Darts mode and Tactics! Energy saving auto power down! 8 skill levels in Tactics and 501 mode! Buy a Dartsmate Pro or Dartsmate Elite Right Now! Note: You DO NOT need a PayPal account to purchase. Click the "Buy Now" button and then select "Don't Have a PayPal Account?" You will then be able to purchase with any credit card. Alberta and northern Territory customers please contact us for payment at your tax rates. U.S. Customers please contact us for tax-free payment in US funds.